North Carolina’s anti-LGBTQ law is unconstitutional. North Carolina Gov. Pat McCrory, who signed an anti-LGBTQ bill into law on Wednesday. On Wednesday night, in the course of just a few hours, North Carolina became the most anti-LGBTQ state in the country. In a special session called for exactly this purpose—and which cost taxpayers $42,000 a day—the legislature passed a stunningly vicious, completely unprecedented bill stripping LGBTQ North Carolinians of their rights. The measure revokes local gay and trans nondiscrimination ordinances throughout the state, effectively legalizing anti-LGBTQ discrimination, and forbids trans people from using the bathroom that aligns with their gender identity. That includes trans public school students, many of whom will now, in effect, be barred from using the bathroom at school. 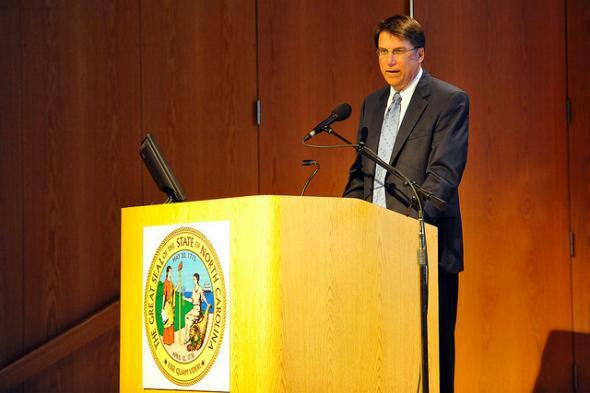 McCrory should know something about government overreach. The gallingly cruel bill he just signed doesn’t just transgress basic norms of decency and morality. It also violates federal law and the U.S. Constitution. As interpreted by the Department of Education, Title IX of the Education Amendments of 1972 forbids discrimination against trans students in any school that receives federal funding. These schools are prohibited from excluding trans students from the bathroom consistent with their gender identity. The new North Carolina law, dubbed H2, rebukes this federal mandate by forbidding public schools from allowing trans students to use the correct bathroom. That jeopardizes the more than $4.5 billion in federal education funding that North Carolina expected to receive in 2016. Without that money, many schools in the state—from kindergarten through college—will be unable to function. McCrory should prepare to explain to North Carolina parents why their children’s access to education is less important than degrading and demeaning trans students on account of their identity. HB 2 classifies and targets trans people on its face, rendering its anti-trans provisions immediately susceptible to Romer scrutiny. (Legislators justified this assault by claiming that trans nondiscrimination laws permit sexual predators to attack women in bathrooms, but this is pure and proven fiction, which cannot pass even lenient judicial review.) The law’s attack on gays and bisexuals, however, is slightly subtler. Instead of naming sexual minorities, the law bars municipalities from passing nondiscrimination laws that extend beyond the statewide standards—which, of course, do not forbid sexual orientation (or gender identity) discrimination. So, in practice, no city can legally protect its LGBT residents. And even if a court were somehow not convinced that HB 2 runs afoul of Arlington Heights, another, even more venerable precedent controls: 1967’s Reitman v. Mulkey, whose continued vitality the Supreme Court recently reaffirmed. In Mulkey, the court confronted a purportedly neutral California law that prohibited any legislative interference with property owners’ right to refuse to sell or rent their property for any reason. The court rightly noted that even though the law did not explicitly mention discrimination, its “immediate design and intent” was to establish a “right to privately discriminate” in a manner that directly harmed minorities. Thus, the law’s efforts to leave discrimination as its subtext could not save it from crashing into the shoals of the Equal Protection Clause.